Hill and Wang, 9780809094745, 224pp. Featuring breathtaking panoramas and revelatory, unforgettable images, Battle Lines is an utterly original graphic history of the Civil War. 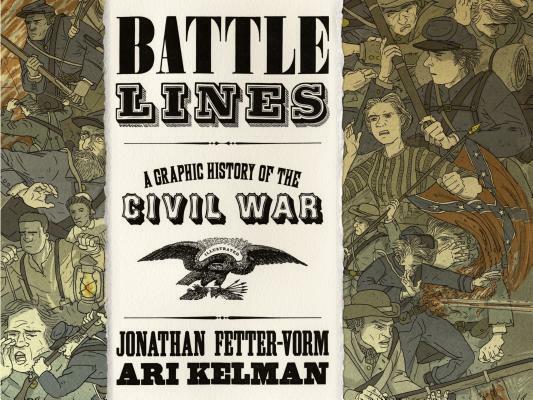 A collaboration between the award-winning historian Ari Kelman and the acclaimed graphic novelist Jonathan Fetter-Vorm, Battle Lines showcases various objects from the conflict (a tattered American flag from Fort Sumter, a pair of opera glasses, a bullet, an inkwell, and more), along with a cast of soldiers, farmers, slaves, and well-known figures, to trace an ambitious narrative that extends from the early rumblings of secession to the dark years of Reconstruction. Employing a bold graphic form to illuminate the complex history of this period, Kelman and Fetter-Vorm take the reader from the barren farms of the home front all the way to the front lines of an infantry charge. A daring presentation of the war that nearly tore America apart, Battle Lines is a monumental achievement. Ari Kelman is the McCabe Greer Professor of the Civil War Era at Penn State University and the author of A River and Its City and A Misplaced Massacre, winner of the Bancroft Prize and the Avery O. Craven Award. He is a regular contributor to The Times Literary Supplement and has written for The Nation, Slate, and The Christian Science Monitor, among other publications. He lives in State College, Pennsylvania, with his wife and two sons.